Experiments with bread – updated | Fork off, heart disease! As you may recall, I have been playing with bread recipes, with mixed results. The texture was never quite great and the crust was wanting. Good thing I have great friends that can come to my rescue! So my friend Christine mentioned in the comments that I needed to get Andrew Whitley´s Bread Matters. She is an accomplished cook and baker so naturally, I welcomed her sage, kitchen wisdom. But before buying another book, I thought I would give one of Andrew´s recipes a test drive. I found this article that he posted in the Guardian with one of his wholewheat recipes. 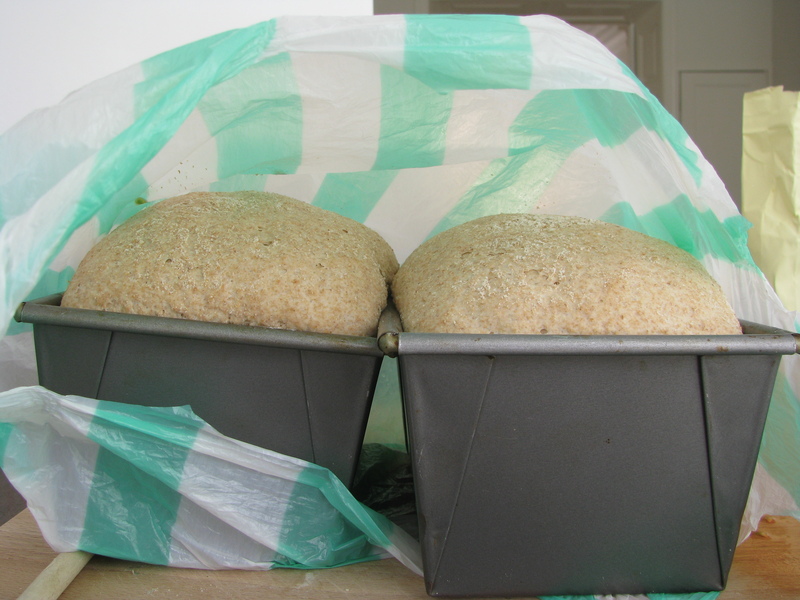 The recipe calls for a longer ferment time with a sponge to allow the gluten and flavour to develop. Since I wanted two loaves, I doubled the recipe and followed the proof time and baking according to this recipe here since I was not making buns. And how did it turn out? Wonderful! Great crumb and very crispy crust, just the way bread should be. 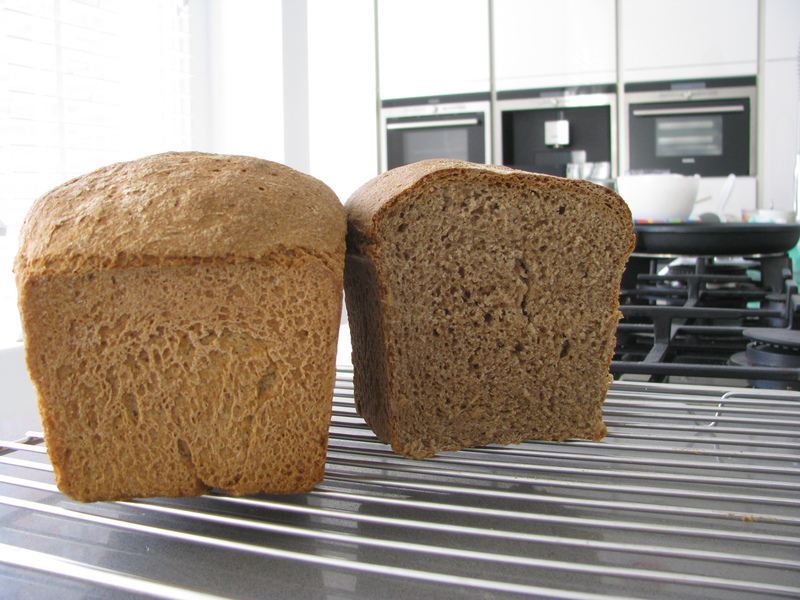 So thank you Christine for saving me time and money that I would have wasted on lesser bread recipes. I have placed my book order :-). The end result – YUM-tastic! Glad you loved it! His book really tells you everything you need to know about bread. What is especially interesting is what he says about what actually needs to be in bread (flour, water and salt and wild yeasts… no more!). You’ll love his book. Pour 3 cups of boiling water over 2 cups of rolled oats (can be quick OR old-fashioned), add 1/4 cup of olive oil, stir, let sit 20 minutes. Meanwhile, dissolve 2 tsps sugar in 1 cup lukewarm water and sprinkle 4 1/2 tsps of yeast over this. Let stand 10 minutes. Then stir briskly with a fork. Set aside. Add the yeast mixture to the oat mixture. 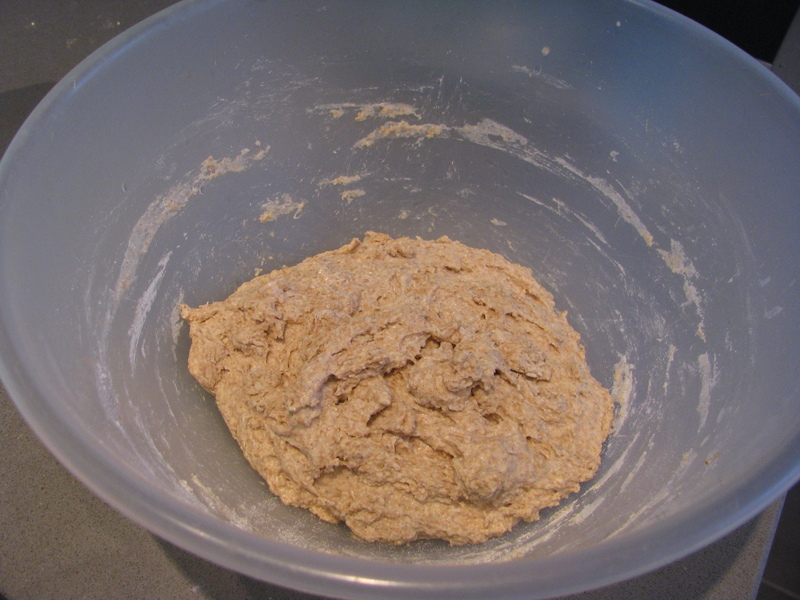 Now stir in 2 1/2 cup whole wheat flour (can be stone ground, but the crumb will not be as strong). Mix vigourously. Continue to add 1 cup whole wheat flour and stir in. Gradually add 4 1/2 to 5 cups all purpose white flour. Turn out on a floured surface and knead in flour (white or whole wheat) until dough is no longer sticking to your hands. Continue kneading for 8-10 minutes, until gluten is worked and dough is smooth and springy (over time you will develop a feeling for when bread dough is developed). Place in greased bowl and cover, let rise until doubled. Punch down, divide in 4, shape into 4 loaves and place in loaf pans. Let rise until doubled. Bake at 400F for 20 – 30 minutes or until it smells and looks done. (Watch carefully). (With thanks to The Purity Cookbook, Maple Lead Mills). Stir in 4 1/2 cups flour (I use a combination of white and whole wheat.. have fun with this). Mix to a soft dough. Let dough rest 10 minutes under a bowl … and NO MORE. Cut into 12 pieces. Roll pieces into 10 inch long “snakes” as the children say. Wrap snakes around your hand, making a ring, sealing the ends together and roll under your palms on a surface to make a semi-even ring. Place on parchment paper covered baking trays (and if you can get your paws on stoneware, this is where it will shine!) and let rise, covered, for 30 minutes AND NO MORE! It won’t be doubled in size, but that is OK! In the meantime, bring 3 quarts of water and 2 tbsps of HONEY to a boil in a large large pot… don’t turn your back on this as it will be a sneaky beeatch and over boil as soon as you turn away… trust me. Prepare a tray or cutting board with a clean tea towel over it. Get yourself a nice big slotted spoon or skimmer. Make sure you don’t let those bagels rise more than 30 minutes… I’m serious. Place risen (no more than 30 minutes) bagels in the boiling honey water (don’t over crowd them… I usually do about 4 at a time). Boil for 90 seconds, flipping once. Don’t over boil. Take them out with your skimmer or slotted spoon and let them drain on your tea towel covered tray/cutting board). Repeat until they are all done. At this point you could dip them in hemp seed or sesame or poppy seed, but I find it does not adhere well without an eggwash to help.